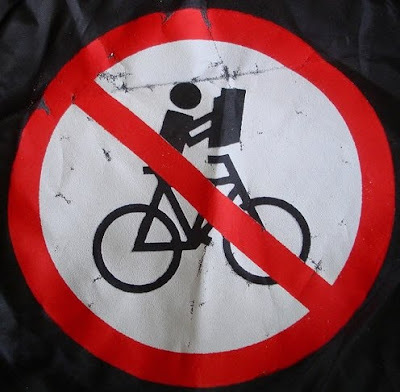 They didn't cut any corners when writing about Dutch bicycle culture.
. 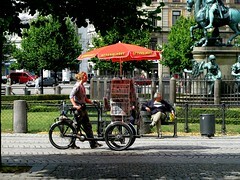 Although the Italians figured out newspaper transport on bicycles decades ago. This is a common sight. 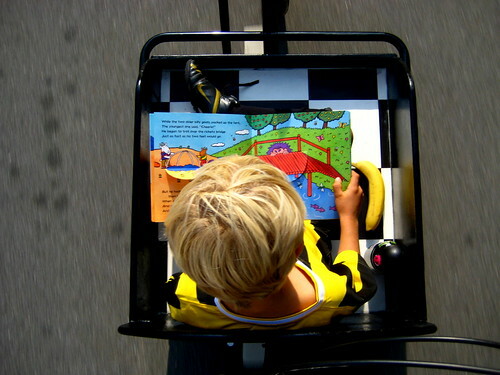 Kids in cargo bikes reading books on their way home from school. The archive photo I use for the Slow Bicycle Movement is from the heyday of the legendary Six Day Races. Back in the day the riders cycled literally for six days straight around the velodrome. At night, when your partner was catching some shuteye, cyclists would casually pedal in circles reading, like in the photo, with one leg up on the handlebars and the other pedalling. I've seen a photo of a cyclist shaving on his bike, as well, but can't bloody well find it. In the morning when the crowds started filing back into the velodrome, the race was on again. If you're ever in Copenhagen in February, you may want to catch the modern version of the Six Day Race at the Ballerup Superarena.